Colors :	Orange (Citrus Splash), Blue (Berry), Pink (Bubble Gum), Red (Strawberry), Brown (Root Beer), Purple (Grape), White (Peppermint), Dark Brown (Chocolate). Packaging :	250 per bag, per color. 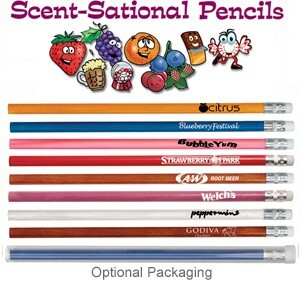 Note: Pencils can be packaged one scent per bag only (scents cannot be mixed within a bag). Example, if an order is placed for 1,000 pcs, order can specify up to 4 pencil colors only. Packaging :	Add $ .25 (G) each for pencils individually inserted into a clear round tube. Not recommended for children under 3 years.